It comes as a surprise to many of my friends that writing a book isn’t an instant process. Although I don’t know why, since most of them can’t even write a coherent note to the milkman given four weeks, a following wind and a thesaurus, but there you go. Anyway. Writing a book takes flipping ages. Then you have to build in the time for editing, cover designing and all that, so it can be about nine months from the moment you first have the bright shining idea to the book actually appearing in a form that people can hold in their hands (when it is considerably less bright and shiny and you frequently don’t care if you never hear the word ‘context’ again). And with this big time delay come inherent problems, the chief among them being seasonality. I was writing Christmas Secrets by the Sea during the summer. A very long, and hot, summer. Imagine, if you will, the sight of an author trying to conjure the sights and smells of a winter storm on the Dorset coast, with concomitant wind, rain and other inclemencies, whilst being subjected to thirty-degree sunshine and an inconsiderate amount of gentle breeze and cloudless sky. It was tough! Fortunately I live in a house with an inside temperature so low that all visitors come in, shiver and say ‘is this place haunted?’ even during the hottest days, so I never had to resort to sitting with the fridge door open whilst listening to recordings of thunder and lightening and rubbing myself with ice cubes to get into the right mood. Anyway. I’ve started a new book now. It’s set during a long, hot summer. Guess when I’m writing it? Go on, take a wild stab – I’ll give you a clue: I’m wearing two fleeces and the tip of my nose just fell off. Jane’s new book, Christmas Secrets by the Sea, will be out on Thursday 13 December. Happy Christmas! Tansy's life has fallen apart - but can she find a second chance at love on the wind-swept Dorset coast? 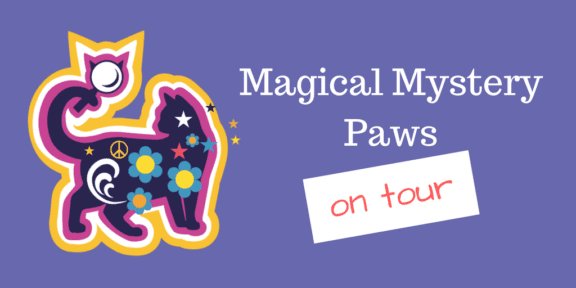 We’re very excited to be bringing you Magical Mystery Paws, a new cosy mystery in the No. 2 Feline Detective Agency series by Mandy Morton – it will be available from bookshops near you from Thursday 12 July. 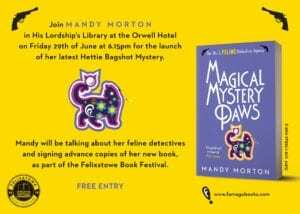 But if you don’t want to wait that long to meet feline super-sleuth Hattie Bagshot, Mandy will be on tour next week in Cambridge and Felixstowe – don’t miss out! 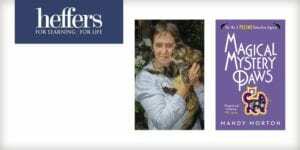 On Thursday 28 June, meet Mandy at Heffers Bookshop in Cambridge, 6:30-7:30 pm. The event is free to attend, and you can book your place here. On Friday 29 June, join Mandy in His Lordship’s Library at the Orwell Hotel in Felixstowe at 6:15pm. At both events Mandy will be talking about her feline detective and signing advance copies of the book. Farrago Books has acquired poet Isabel Rogers’ fiction debut, Life, Death and Cellos, in a two-book deal bringing the baton down on the Stockwell Park Orchestra Mystery series. The series, following the adventures of an amateur orchestra in London, is a perfect addition to Farrago’s humorous fiction list, following recent acquisitions of titles by Mandy Morton, Chris McCrudden and Jonathan Pinnock. The opening novel, Life, Death and Cellos, finds the Stockwell Park Orchestra facing financial ruin after a guest conductor drops dead on stage, squashing and injuring their primary benefactor. 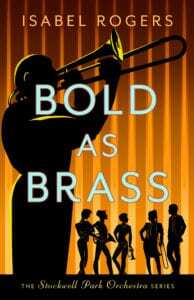 In a tale marrying the insight of Sue Townsend with the farcical humour of John O’Farrell, a priceless cello is abducted, a conductor is stranded on the wrong side of the Atlantic, and Erin the cellist stumbles (eventually) on her true calling in life. Isabel Rogers won the 2014 Cardiff International Poetry Competition and has been shortlisted twice in the Charles Causley poetry prize. She was Hampshire Poet Laureate 2016 and her debut poetry collection Don’t Ask was published by Eyewear in February 2017. Life, Death and Cellos will be published in ebook, paperback and audiobook on 14 February 2019 and promoted through the book trade and direct to the Farrago mailing list of humorous fiction lovers. The second title in the series will be published later in 2019. Have you discovered the joy of audiobooks yet? They’re a fabulous way to enjoy great stories when you’re travelling, keeping fit, working, relaxing – in fact, almost all the time! Here’s a list of all our current titles. We hope you enjoy them, and we’d love to hear what you think! Follow us here on our blog, and on Twitter and Facebook, to stay up to date with new titles. 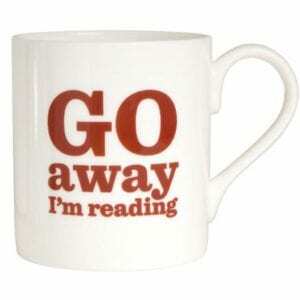 And subscribers to our newsletter (see link on homepage) will get regular updates too, of course. Meet horse-faced Bartholomew Bandy in his first high-flying adventure. The latest Farrago newsletter has just landed, packed with news of bookish goings on at Farrago HQ. If you missed your copy, don’t worry – you can sign up for the next edition on our home page. Who is the author of Miss Seeton Sings? Send your answer to readers@farragobooks.com by Monday 12 February. Click here for terms and conditions. And for more bookish treats, do check out the Literary Gift Company website. Don’t miss out – enter today! And look out for another giveaway in next month’s newsletter, plus all the latest news about new titles and behind-the-scenes secrets from the world of books that make us smile. To paraphrase Mark Twain: two or three persons having at different times intimated that if I would write an explanation they would read it when they got leisure, I yield at last to this frenzied public demand, and herewith tender a history of my first tentative steps in the crime fiction world. My father died a week after my sixteenth birthday. Exams loomed at school. For light relief I picked up his copy of The Moving Toyshop by Edmund Crispin and discovered for the first time that a detective story could be, not only well plotted, not only well written, but could also be fun; sprinkled throughout with literary allusions to enhance the enjoyment of those readers who recognised them, without in any way overwhelming those who didn’t. Many years later, when my own books were first published, I wrote to Edmund Crispin’s widow and explained that I should like to acknowledge my debt by quoting a line from The Moving Toyshop on the topic of coincidence. Would she mind? She replied, by return, that she would not. I was thrilled. 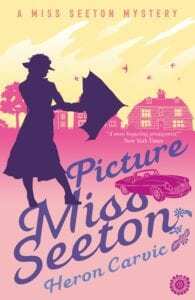 That Sarah J. Mason mystery with its Crispin quotation is long out of print, but in homage to the master Hamilton Crane will from time to time sprinkle a modest literary allusion into Miss Seeton’s adventures, so much less fantastic than the “unlikely events” depicted in Edmund Crispin’s pre-war Oxford. My life might have taken a very different direction if my father had gone to Cambridge – but he didn’t. And the rest is mystery history! 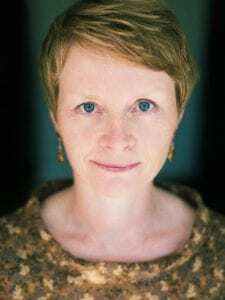 We’re delighted to welcome to the Farrago Books blog Marion Rankine, unrivalled expert in all things umbrella-related in the literary world. Marion’s wonderful book Brolliology was published in November by Melville House. One of the beautiful and terrible things about your book going to print is that you can’t do anything to it any more. No more corrections, no more last-minute edits, no more fiddling about with word choice. It’s a bit like getting on a plane for a meticulously planned trip: you hope you’ve packed what you need, organised All The Things, but if you didn’t, there’s absolutely nothing you can do about it. A feeling of immense relief, laced with a horrible crawling anxiety. 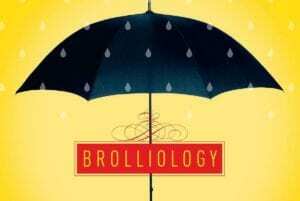 My book, Brolliology: A History of the Umbrella in Life and Literature, was published by Melville House in November 2017. It’s an exploration of umbrellaness – the wonderfully varied meanings that umbrellas have held for us over thousands of years, and how these meanings manifest in literature. It sprung from an impulse of literary collectorship: stung by an insatiable curiosity about bookish umbrellas, I embarked on a long period of umbrella-hunting in my reading, spurred on by hints and allusions in texts, literary criticism and from fellow readers. All in all, the book features passages from over forty essays and novels. There’s a section in my book about umbrella sentience (yes, it’s a thing) and it’s a shame I hadn’t yet encountered China Miéville’s YA novel Un Lun Dun, which features the treacherous Brokkenbroll – master of the broken brollies which have crossed into UnLondon from the streets of London – and the umbrellas (or rather, unbrellas) he gives out to UnLondon citizens to defend themselves against the sentient Smog preying on their world. Indeed, so attached is Lobelia to her brolly that, when she is later rescued from a lengthy and unjust incarceration, she emerges from prison “still clutching her umbrella.” In so doing, she joins a long tradition of literary characters – Mary Poppins, Father Brown, Robinson Crusoe and Mrs Gamp being some of the best-known – who are almost inseparably identified with their brollies. 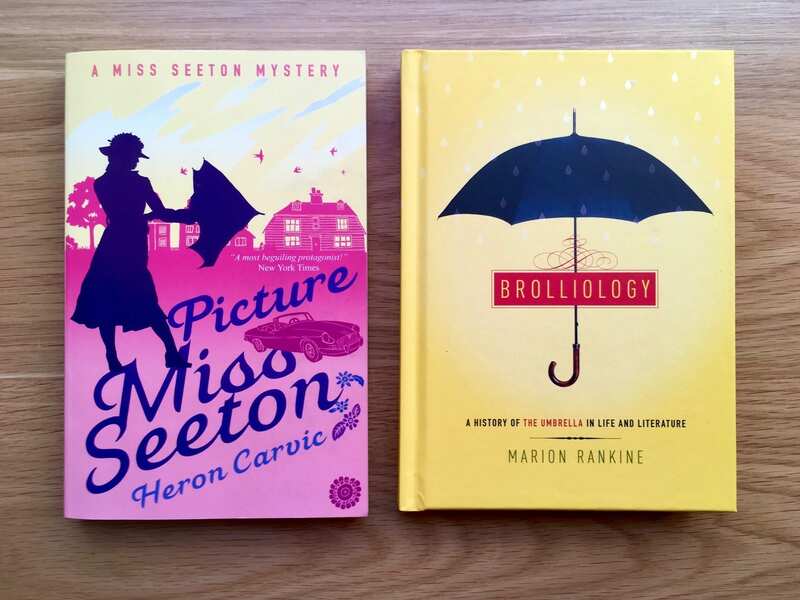 Which brings us to one of the literary umbrellas I’m most pained to have missed out – that carried by the titular character of Heron Carvic’s Miss Seeton series (recently republished by Farrago). Miss Seeton has a habit of dispensing poetic justice to wrongdoers with her rolled umbrella – so much so that she is referred to as “The Battling Brolly” in newspapers. “That woman gets her umbrella into everything,” comments the superintendent of police, but it is well that she does: more than once, her umbrella saves her life. It certainly aids the police in their investigations, even if Miss Seeton herself is terribly ashamed of the small physical violences she inflicts on hardened criminals. It’s a source of some amusement to certain members of the local police force, but as the superintendent gravely puts it, “The Miss Seetons of this world don’t biff people; they indicate displeasure with the ferrule of an umbrella.” In fact, had the Miss Seeton books been penned a century earlier, umbrellas may well have found themselves with a new moniker: robinsons, gamps, hanways (after Jonas Hanway, a pioneer of umbrella use among the British) and chamberlains (after umbrella-toting British PM Neville Chamberlain) all entered the language by dint of association with the fictional or real-world characters who carried them. So, there’s just five spectacular literary umbrellas I missed. Having written this, I will no doubt encounter another in the next book I pick up. It’s one of the more endearing, exasperating qualities of umbrellas: never quite visible when you need one, and glaringly obvious – tripping you up at the top of the stairs, or slathered across a pavement, flapping feebly – when you don’t.